Buttercup is even more adorable in person than she appears to be in her pictures. She loves her foster mommy and follows her everywhere she can. Buttercup is such a sweet girl. She shares her foster home with 6 other dogs ranging from a 12 week old ​German ​Shepherd puppy to a 9 year old, 65 pound ​Lab/Pointer. She does not pay much attention to her foster siblings but is not afraid and will not hesitate to put, even the biggest one, in its place when she gets tired of them being in her space. 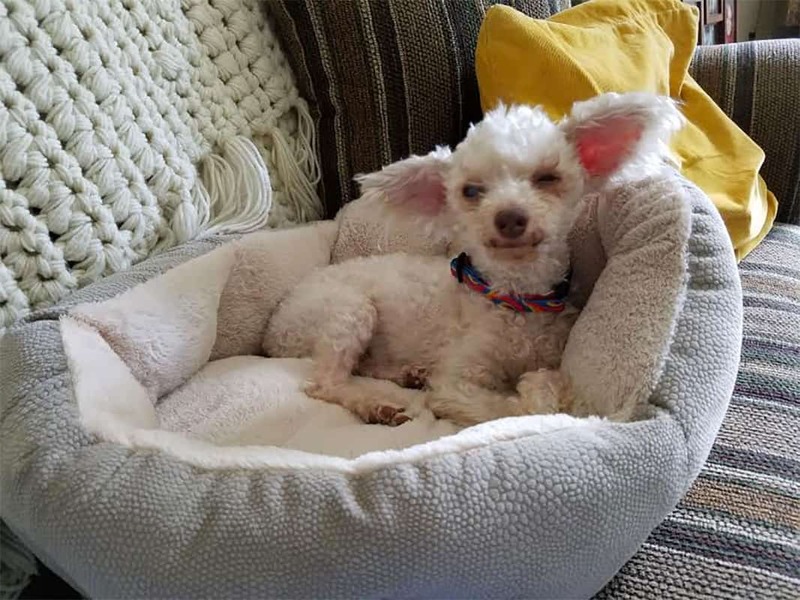 Buttercup is a great mix of couch potato, loving to cuddle on my lap​,​ and spry little pup, up for traveling in the car and playing outside with close supervision since she is so tiny. Even though she loves being on foster mommy’s lap, after a while, she will jump down and find a cozy bed of her own to cuddle up in. At night, Buttercup likes to sleep on a blanket on a chair in the living room. I know she would love to sleep in bed, but I worry about her being in the bed since it is very high and there are 2 other larger dogs in bed. Since she is content downstairs, her foster mom decided to let her adopting family spoil her by taking her to bed with them. She never cried when left downstairs and is very capable of jumping up and down from her chair all by herself. She has not attempted to come up the stairs in her foster home at this time, but she will come up two steps from the yard onto the deck to get back into the house. Buttercup’s foster mom has a hard time crating her, not because Buttercup minds it (she does not)​ ​but because foster mom minds it. When she is crated, she is totally house trained. Since she is not crated by her foster mom, Buttercup goes on pee pads in the house. She will also go outside too when taken out but does not yet bark at the door to indicate she needs to go. Buttercup loves breakfast, dinner and treat time. She is slowly gaining some needed weight and is looking better all the time. She loves doggy treats as well as carrots and watermelon. She is not a picky eater 🙂 . Buttercup was exposed to a baby and a toddler and she fell in love with them, wanting to play constantly. However, since she is so tiny, a household with very small children may not be the perfect placement for her, nor would a household with large, playful dogs who would not understand her warning to be left alone. Buttercup seems to have a little bit of anxiety-type reactive yelping when being picked up sometimes. Her foster mom is not at all concerned that she is in pain, but will have it checked out when she has her next check-up. When she was groomed a few days ago, the groomer said she is certain Buttercup is used to being bathed and clipped, because she was perfectly behaved for everything, including having her nails clipped. Buttercup does the cutest little ballerina move, twirling in a circle when being greeted first thing in the morning or when foster mom comes home from being gone for a few hours. Lastly, Buttercup’s poor vision does not limit her quality of life. She navigates the house and outside very well. She will occasionally bump into things, but seems to be able to see where doorways and clearings are. She would be able to fit through a gate in the yard but the instant she feels something touch her face, she turns and goes the other direction. Because of her small size, Buttercup would need railings on porches, gates and some fences to have extra screening on the bottom 12″ or so she could not squeeze through if she decided she wanted to. Buttercup is a love-bug and deserves a lot of attention and a home that is safe for her. 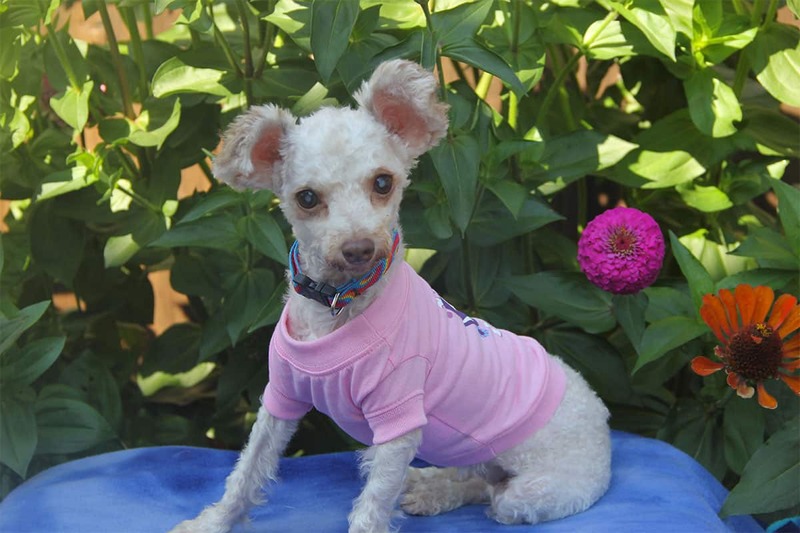 She will make someone a wonderful little cuddle bug who will quickly bond and fall in love with her adoptive family. Buttercup is blind but, otherwise, healthy. 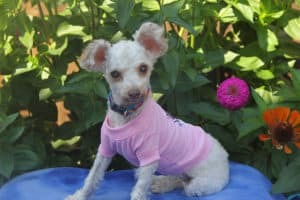 Buttercup is looking for her forever home. If you think it could be yours, read more about Adopting from BDRA before submitting your application below. BDRA relies on your donations to rescue blind dogs around the United States. Please consider giving in support of Buttercup.